The Nintendo eShop’s Virtual Console service has really entered its stride within recent months, delivering little-known classics that you perhaps didn’t previously know existed. Mole Mania, for myself at least, falls into such category. A confession that seemed ever the more embarrassing when I realised that it is a further creation from the legendary Shigeru Miyamoto. At this point, it’s worth mentioning that it remains unclear as to why Jinbe has chosen to take such desperate measures, yet Muddy journeys to rescue his family regardless. His seven lackeys are holding them captive, and it falls to you to help guide him to them. What follows is a joyous puzzle romp through an increasingly taxing series of levels. Muddy has numerous skills at his disposal, the chance to burrow underground being that which is initially introduced. Whilst he wanders above ground, Muddy is able to dig through soft soil that he finds which then sees him able to navigate the subterranean terrain. This is essential, allowing you to bypass obstacles that would otherwise prevent your continual progression through the level. Black balls soon appear, with Muddy being able to push or pull them to arrange a clear path for him to continue forward. Rolling them into holes dotted about the level sees them reset back to their original position, although in the meantime you may have opened a new route for yourself, whereas they may also be used to block or neutralise patrolling enemies. Whilst dropping cabbages, which also appear, into holes will reward you with hearts to replenish your health, with 20 of such vegetables being available to you within each level. 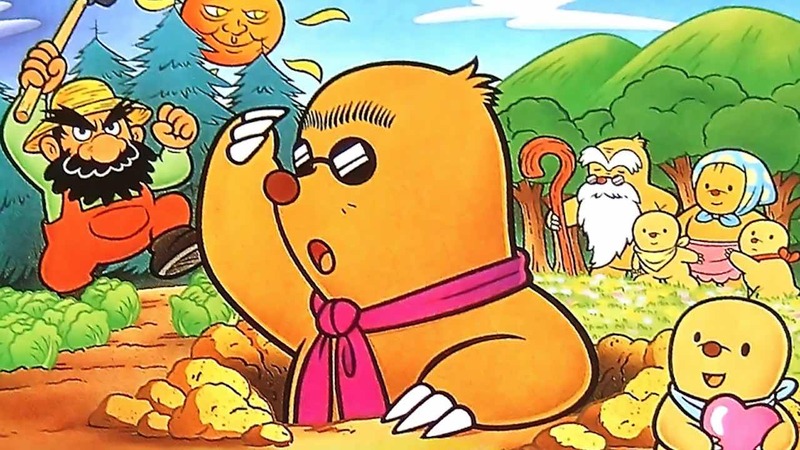 Mole Mania will at times have you scratching your head, perplexed at how to tackle areas, and can be equally punishing if you make a mistake. Burrow in the wrong place and you’ll create a hole that may prevent you from moving balls around successfully, resulting in the need to return to the previous screen so that everything resets. That’s part of the game’s challenge though, with bosses throwing additional mechanics into the mix. The Kangaroo at the end of the first level seeing the player have to shift pins underneath it as it aimlessly bounces around the screen. What makes Mole Mania all the more striking is just how well it holds up despite its age. The Nintendo eShop has played home to puzzle classics such as Pullblox and Fullblox, yet Mole Mania proves a further example that Nintendo’s rich heritage is also worth delving into.